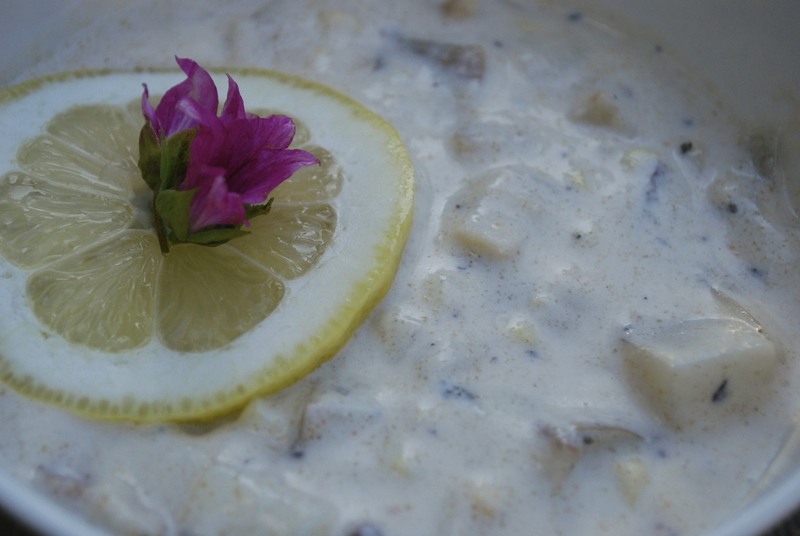 New England Style Clam Chowder garnished with a slice of lemon and salmon berry blossoms. All fruit blossoms are edible, and in addition to being beautiful, some are downright tasty. These days, there seems to be a trend toward making New England Style Clam Chowders thicker and thicker. Unfortunately, to our taste, the thickness is achieved by adding lots of flour, resulting in a somewhat pasty if not downright bland bowl of soup. Our favorite chowders put clams and potatoes up front and emphasize flavor over thickness. We make both New England Style and Manhattan Style Clam Chowders in large pots, freezing the finished product in smaller containers and pulling them out on cold nights throughout the winter. While this is a great way to put to use all the razor clams we used to dig in Oregon and now dig in Alaska, it works well with other kinds of clams, too, as well as with canned clams such as the big, 51 ounce (3 pounds, 3 ounces) cans of SeaWatch chopped clams sold at Costco and other stores. The recipe is never the same twice. The one below is a recent version. One of the keys is to use not more than twice the potatoes, by weight, as clams. Up here in bush Alaska, many of the communities are “dry” and I can’t use one of my favorite ingredients–sherry. If I could, I would add about a 1/4 cup of a quality dry sherry such as Dry Sack. clam juice you’ve set aside. The more, the better. 1. Wash potatoes and remove any eyes, but do not remove the skins. Cut into ½ inch cubes and place in a large bowl. Set aside. 2. Fry the bacon pieces till tender. Do not crisp. Drain the grease and set aside. 3. In a large pot, add the olive oil and heat over medium-high. Add onions, stirring frequently for about five minutes until they begin to turn translucent. Add garlic and stir again. 4. Add flour and stir in thoroughly. Add two tablespoons of butter (or more olive oil) if necessary to completely mix in the flour. 5. Immediately add clam juice and milk. Stir. 6. Add potatoes, seasonings and salt and enough water to cover all. Slowly bring to a simmer and cook until potatoes become tender, stirring occasionally. About 45 – 60 minutes. 7. Add cream and lemon slices and return to just under a simmer or barely simmering. 8. Add the clams and the remaining butter and turn heat to low. On a propane stove, you may need a flame tamer. Continue cooking for 10 minutes. Serve with a big hunk of toasted sourdough bread and a Chardonnay, a Pinot Gris, or a good ale. ← Cloudberry Sorbet – Sublime! So great to meet you yesterday, Barbra! If I return to Point Hope next Summer, I _do_ hope to be invited for supper. Yum! Really interested in hearing about your clam digging. Too warm down here to think about winter stews, but once Dec/Jan rolls around, this would hit the spot! I still remember the delicious chowder and cornbread you made in Sacramento…so I know this would be just as tasty!